As irony would have it, the new friends I’d made were all due to leave the country during my birthday. The Kiwi lads from the hostel had to scoot over to Dubai for 5 days and Anya was travelling to Nepal for the first-ever Fishing Cat Working Group meeting. I was very jealous but also crazily excited for her. Some species conservationists fight among themselves to be ‘The Person’ to save the species; the fantastic idea behind the Working Group is to bring the researchers together to share information, skills and ideas. With this exchange of knowledge hopefully realistic and practical strategies can be implemented throughout the fishing cat’s range in an effort to protect the species. Species survival, after all, should be about the animals and not individual ego. The organisation which Anya worked for had said, during my first week, that I was welcome to explore any of their other wildlife projects. As it stood they actually only had one other but it was a very interesting human–animal conflict project, focused on a species I knew very little about – crocodiles! Now was the perfect time to cash in that kind offer. The principal investigator was Dinal and after chatting to him a few times, I knew his herpetology (fancy name for amphibian and reptile) knowledge was ridiculously amazing: I was going to learn heaps. Dinal’s study site was in Matara located 100 miles south of Colombo, so I would have to catch a bus to meet him there.My first-ever bus ride, and I would have to track it down in the chaos that was the central bus station. Having been in Sri Lanka for more than 2 months now I was well aware of their ‘organisation’. This was going to be interesting. Upon arrival I noticed there seemed to be no discernible order as to where the buses stopped, nor was it easy to work out where they were going. Asking didn’t help, even if I pronounced the name correctly, my accent made me about as intelligible as a toddler, and to top it off most of the buses had no destination signs on or were written in Sinhala which I had no hope of reading. I didn’t think my approach to eating (if you don’t know what is says –order it!) would work in this situation. Who knows where I’d end up? And explaining that I got on the wrong bus because it had the best looking name would sound more stupid than the usual things that tumbled out of my mouth. Luckily, Maduranga had driven me to the station and, although there were buses everywhere, he seemed to know some secret that eluded everyone else as the first bus he happened upon was the one to Matara. Unfortunately the bus was full, but we were informed another would be along shortly; knowing what Sri Lankan timing was like I prepared for a long wait. Surprisingly, only 10 minutes later another bus did appear and was also bound for Matara. I thanked Maduranga, climbed aboard and claimed a seat by the window. The seat next to me was the last to be filled, many passengers had come along for a gander but, having seen me, moved further down the bus. Maybe my pale skin reflected the sun that was streaming through the window too much, and I was just too damn bright to sit next to, or perhaps I just looked a tad odd. It wasn’t what I expected. The bus, or rather coach, was air conditioned and the seats had little fans overhead. It seemed cushy and un-Sri Lankan. I spoke too soon. The moment the driver turned the key in the ignition the TV roared to life. Some long haul coaches in the UK will have a small television and quietly play a movie, but this was Sri Lanka and everything is loud. The TV was attached to three enormous speakers distributed throughout the length of the coach and it screamed some local music. Oddly, the tunes sounded like some bizarre love child of a Marachi band and 90’s house music. Mercifully, I only had to endure it for about 2 hours. The good thing about travelling by train in Sri Lanka is that at each station there is a sign with place name, telling you where it has stopped. But on a bus, well– that’s a different story. There are no friendly signs with place names, and if, like me, you don’t speak Sinhala (my understanding is limited to animal species) you cannot ask someone where you are, God only knows where on earth you’ve stopped. Luckily my journey was really straightforward; get on at the beginning and get off at the end. It was an uneventful ride, not much to see as it was a straight run down the new motorway. At what I assumed was the final stop, and after asking a very bemused lady, I exited the coach and thankfully there was Dinal. Mission accomplished! After a short stop to drop off my luggage at a hostel we hailed a tuk-tuk and drove down to the river to meet a local fisherman, who doubled as Dinal’s research boat driver. It was here that I came across my first glimpse of health and safety in Sri Lanka, I was given a life-jacket to wear before boarding the boat. Being a good swimmer I assumed the jacket was more to aid in hauling me out of the water if my clumsiness took hold, or as something to catch in a crocodile’s teeth if one decided to make friends. The river was beautiful. I felt like one of those wildlife documentary presenters you hate, as you watch them gabbing about wildlife surrounded by the most stunning scenery. 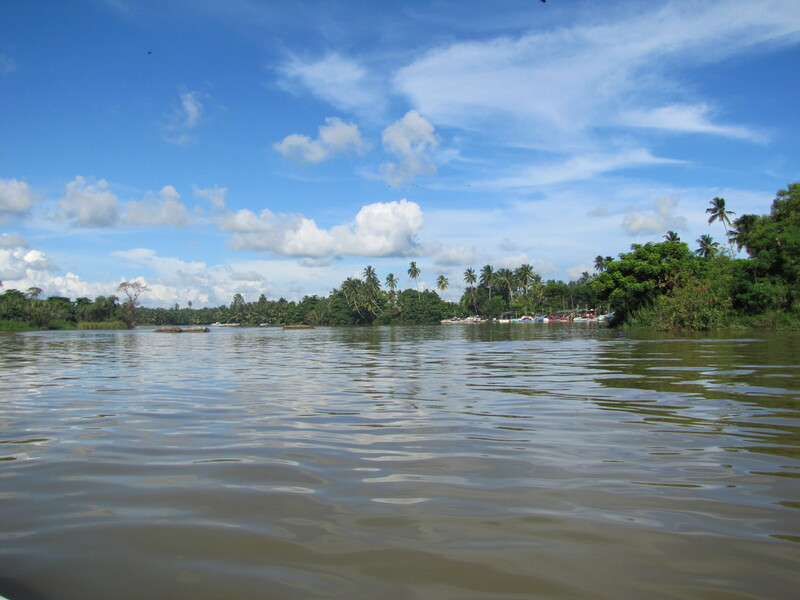 We started at the mouth of the river and made our way upstream to spot crocodiles. It was vastly different from what I imagined. What little knowledge I had was gleaned from wildlife documentaries, which usually show crocodiles lazing basking on the river bank. As it turned out, Saltwater crocodiles spend most of their time during the day staying out of sight; they prefer to remain submerged at the edges of the river under cover of bank foliage or trees. After about 15 minutes we came across one: my first-ever wild crocodile! In my usual child-like fashion I barely contained my excitement by bouncing in my seat and rapidly (and somewhat energetically) slapping Dinal on the arm. The sneaky reptile had only his eyes and a tiny portion of his back above the water, in a shaded area, at the side of the river, under a tree. That sentence almost belongs in a ‘hide-and-seek’ children’s book! How Dinal spotted it I have no idea. The croc was a beast, 18ft long. Those little eyes were captivating, they had the cool and calculating look of an amazing predator. As we drew closer the animal decided enough was enough and, with a powerful flick of its massive tail it dived out of sight. We continued up river for about 4 hours. 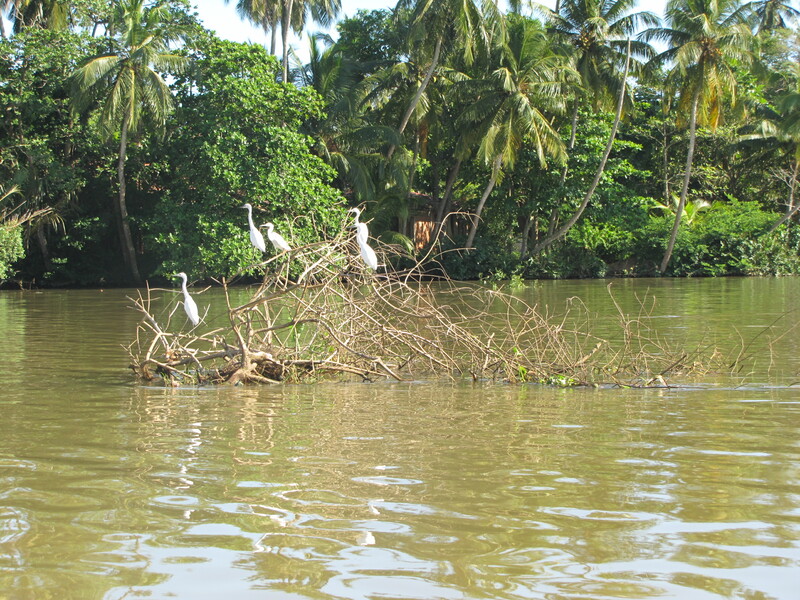 Although we didn’t see many more crocodiles, the entire area was teeming with bird life. I saw at least 7 new species of birds, including the stork-billed kingfisher which I’d been itching to see. The light began to fade and the fruit bats started appearing in the sky. I don’t know why, but no matter how many times I see them they always make me smile; maybe it’s because most species of bats in the UK are small insectivores (bug eaters) and zoom past at the speed of light, thus making them very difficult to see. In comparison the flying foxes, being frugivorous (they eat juicy fruit), have no need to chase after their dinner and can therefore flap around at a leisurely pace (after all who has ever seen a mango run for its life?). As the sun disappeared beneath the horizon we pulled up to the bank and hopped out; it was time to collect our mini sun, aka a spotlight, for the evening survey. We nipped around the corner to a mechanic’s in order to hire a car battery to power the spotlight. It seemed a tad excessive to begin with until I remembered that the spotlighting surveys I’d done in Africa, and those which you see on the television, are all done from the back of a Land Rover and therefore the lights were connected to the car battery. After some confusion as to whether the battery was charged or not, we arrived back at the hostel with 2 batteries, which may –or may not– have had enough charge to power the light. A quick 30- minute cat nap and then it was back to the boat. From 8pm till about 12:30am we zoomed up the river. Dinal on the main spotlight, his research assistant, whom we had met up with at the hostel, with a clipboard, and me with a spare torch –eagerly searching for eye-shine like some manic pirate hoping for a glimpse of treasure. As it turned out neither of the car batteries was particularly well-charged, so the lamp had to be constantly switched between the two; luckily we also had 3 other strong hand torches as back-ups. Based on the size of the animal’s head it was possible to estimate the length of the croc; this combined with it’s life stage and position within the river (i.e. out in open water, on the bank, among foliage, etc) were noted down. We came across heaps more crocodiles than we had during the day, lots of which were hatchlings and looked absolutely adorable. The boat engine cut off and we silently drifted towards the bank of the river. Quick as a flash, Dinal’s hand darted out and managed to grab a very young salty. It was just too cute! I’m aware I may sound a tad odd, but with that snappy little mouth filled with razor-sharp death and those unimpressed eyes, that clearly hadn’t forgotten that it’s ancestors had once ruled the Earth and seemed to scream ‘fear me, puny human!’ who couldn’t agree with me? This prehistoric-looking creature was stunning. After a few pictures and a fantastically close look we plopped the little guy back into the river and continued on our way. 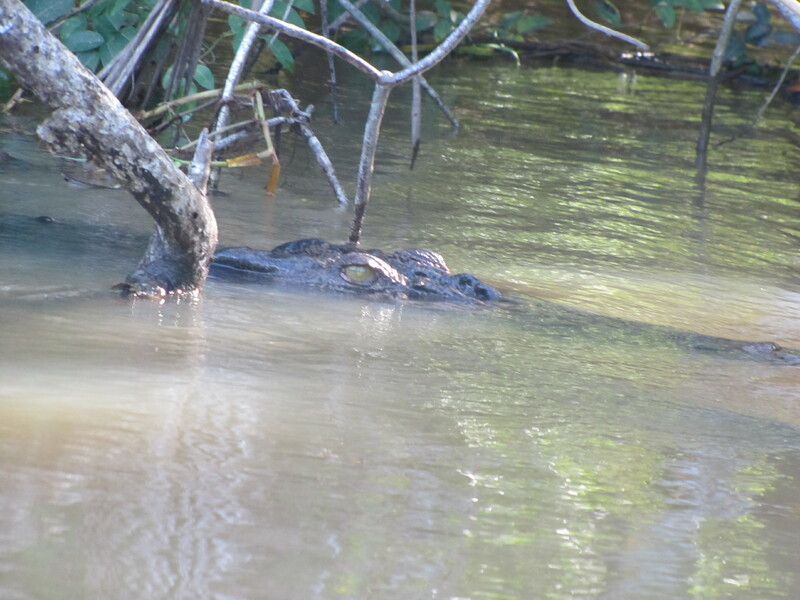 Just as I started to get my eye in and spotted a few crocs of my own –the boat turned around! The survey was done. In previous weeks Dinal had taken body measurements of crocodiles from hatchling size up to 4ft in length, and tonight –on our way back– he hoped to catch a 4-footer to haul aboard the boat to complete his data set. Ideally he wanted measurements from the entire size range of crocodiles but due to the stature of the current research vessel any croc 5ft or bigger just wouldn’t fit. As amazing as handling the hatchling had been I was eager to see a larger crocodile up close, but alas, it was not to be. The few animals that we saw that were of the correct size either submerged before the boat got close enough, or the engine was cut a little too late and we glided over them as they dived. It was a tad disappointing but animals, especially wild ones, rarely co-operate, plus whoever said conservation research was easy? Despite being almost midnight it was still a lovely 18°C, which practically felt like English summer to me. Amusingly, Dinal turned and mentioned that it was getting a bit chilly. With a massive smile, I cheekily asked him if he wanted me to get my cardigan out of my bag for him; I received a bemused ‘no’ as he pulled his neck scarf up to his chin. It was one of the few things I’d be able to wind him up about as I knew full well that, tomorrow, he could easily mock me as I melted in the heat. We arrived back at the hostel at 1:30am, I was shattered and it was definitely time for bed. 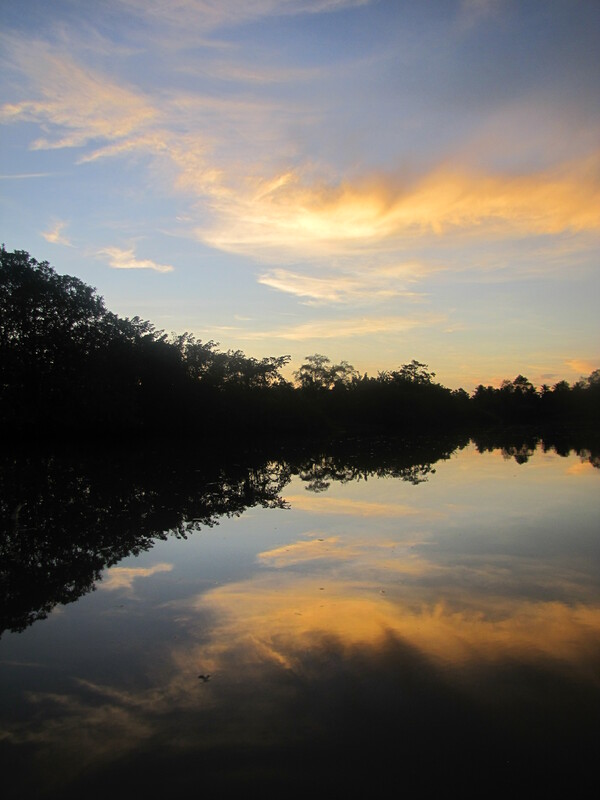 After a bit of a lie-in the next morning we made our way to Wilpita, a forest reserve. 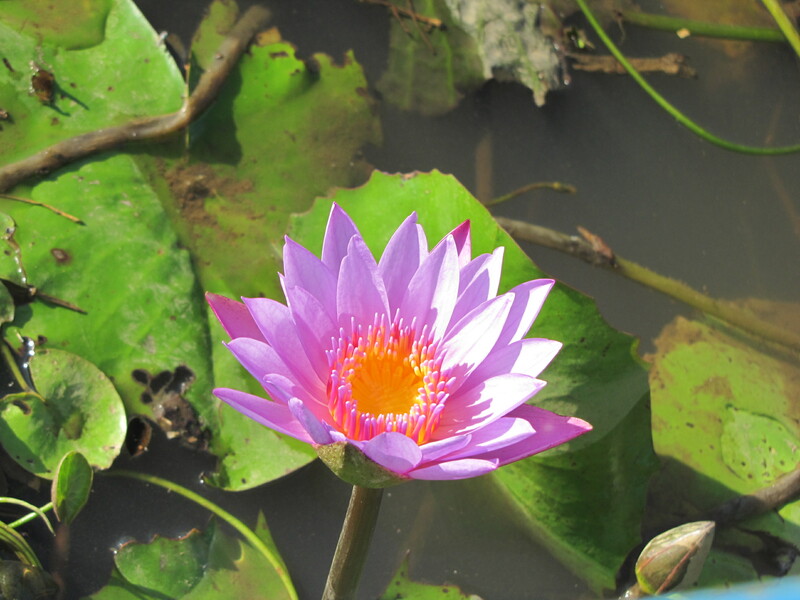 The mission of the day was to find snakes, lizards and frogs and, as much as possible, to avoid the leeches. 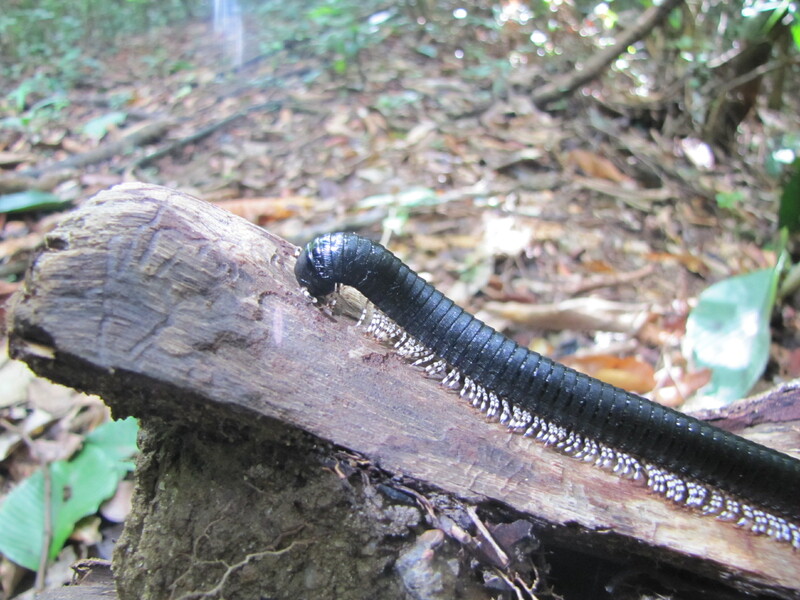 Back home, the only leeches encountered are aquatic and seemingly lazy compared to the possessed vampiric kind found in Sri Lanka. Before leaving for the forest we donned our leech socks which reached the knee, did all buttons up and attempted to minimise the looseness of our shirts. 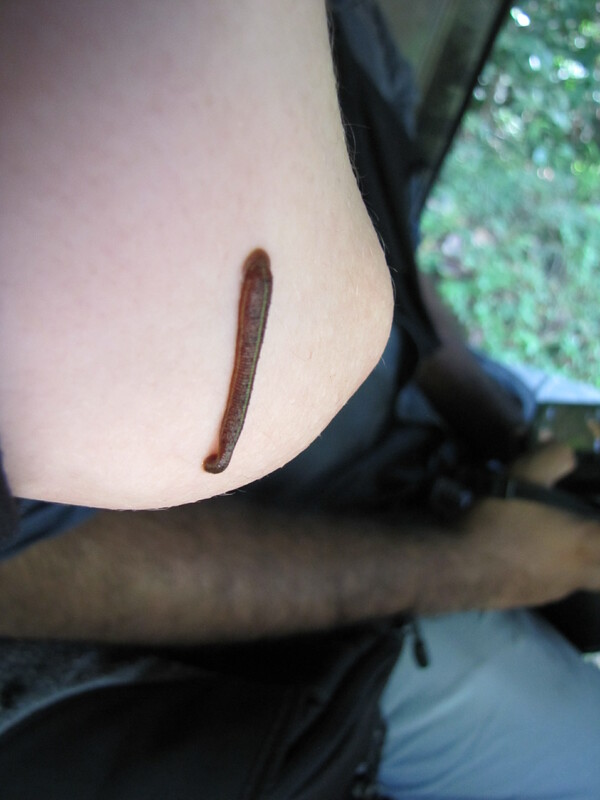 I needn’t have bothered, within 5 minutes of entering the forest I’d made a leechy friend, he dropped out of a tree onto my arm. 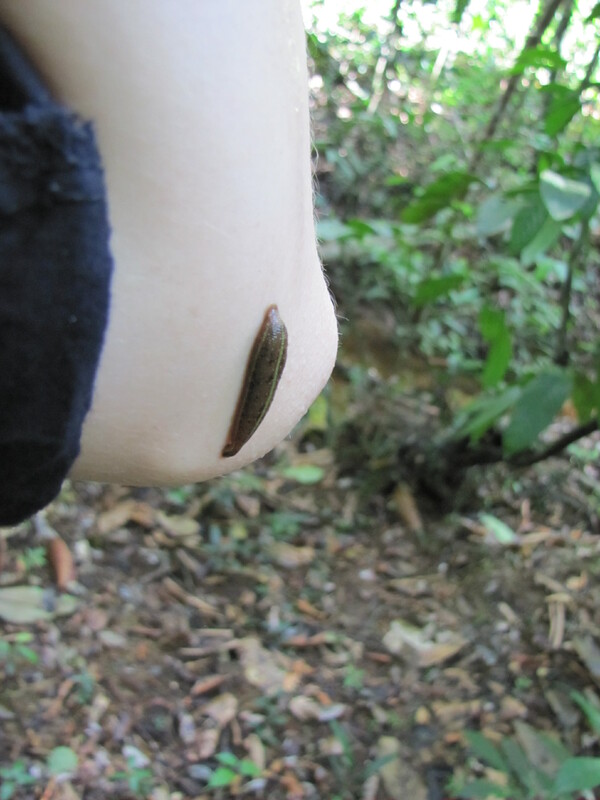 Unlike their sluggish cousins in the UK these leeches actively reach out to find you. I’m not sure how they sense that you’re near, but it’s like something out of a horror film when you look down and the ground is squirming. Their rear ends stay attached to whatever they’re holding on to, and they wave around frantically trying to make contact with their mouths. I wasn’t too fussed having it on me, as long as it was where I could see it and after all it had made a good effort for a bit of dinner. I was actually intrigued to see just how much it would increase in size as it gorged on its foreign meal. All in all I ended up with 5 new temporary travelling companions. One had managed to get beneath my shirt and was making his (it had to be a he) way towards my chest. I managed to flick him off before he became attached, but via some Matrix-style mid-air spin, the litter bugger managed to swing round and attach to the tiny bit of skin between two of my fingers. I was impressed! Not in the slightest bit amused but impressed none the less. Depending what you work with, be it criminals or animals, I believe that your eyes become attuned to looking for particular things. As a former small carnivore keeper I’m very good at finding animals in zoo enclosures, whereas Dinal was a freaking forest wizard! He’d point out a lizard on a tree somewhere in the distance, and I wouldn’t have a clue where he was talking about. 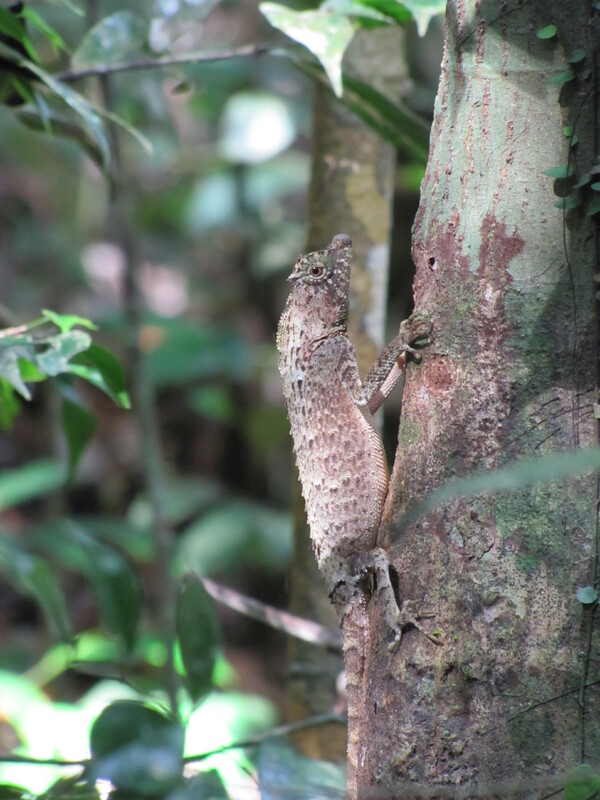 We would be a few feet from a 20cm lizard and only then would I eventually see it. I had to remind myself that this was his profession, that he had been finding reptiles and amphibians since he was a young boy and I therefore wasn’t going blind. 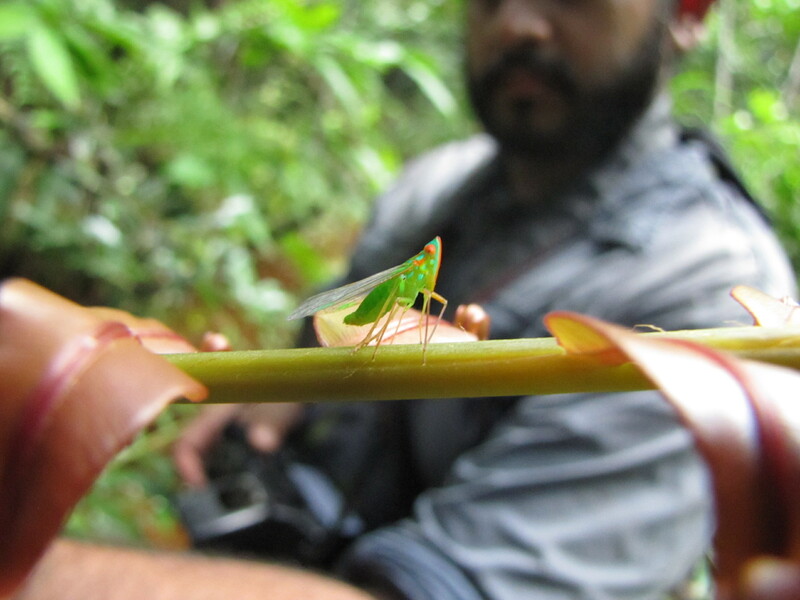 Luckily my easily-distracted nature comes in handy sometimes and means I’m actually very good at spotting bugs. To my delight I managed to redeem myself. On more than one occasion I would point out an insect to Dinal, and he’d be just as confused as to where it was as I’d been with the reptiles. After wandering around the forest for a few hours we heard a tree come down somewhere nearby. A few minutes later we happened upon some illegally cut trees with the loggers equipment strewn all around. 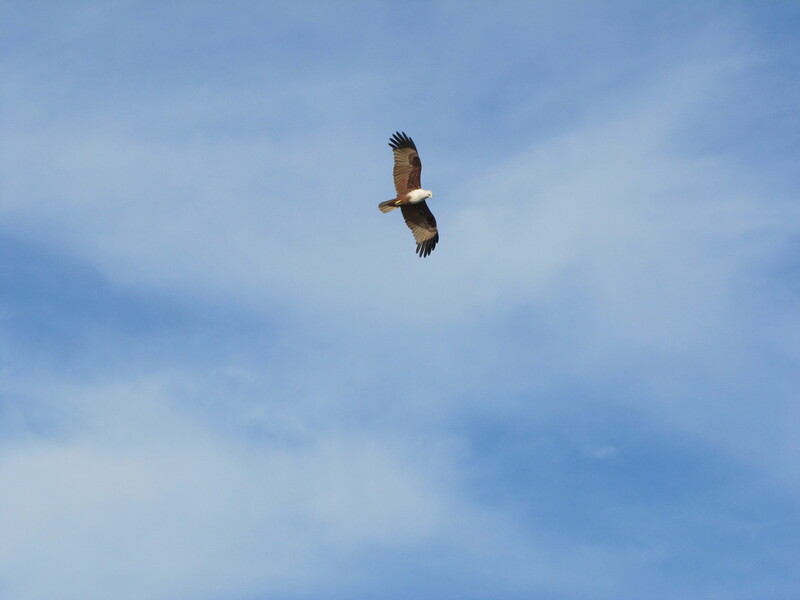 After taking some quick pictures and calling the nearby Forestry Office we decided to make a swift exit. Eventually my leech hitchhikers dropped off. I was glad the shirt I’d chosen for the day was black, as my bites continued to bleed for a while and I was able to mop my arms without looking like I’d murdered someone. When attached leeches pump an anticoagulant into your system via their saliva to stop your blood from clotting, you can’t blame them, after all who wants the food to run out half-way through dinner? Two buses and a tuk-tuk ride later and I arrived back at my hostel in Colombo, I needed to try washing the blood out of my shirt. Four sink-fulls of water later and the brown tinge of blood started to disappear. Some of you may be asking why I didn’t just rip the leeches off to begin with instead of becoming a walking banquet. The reason is two-fold. 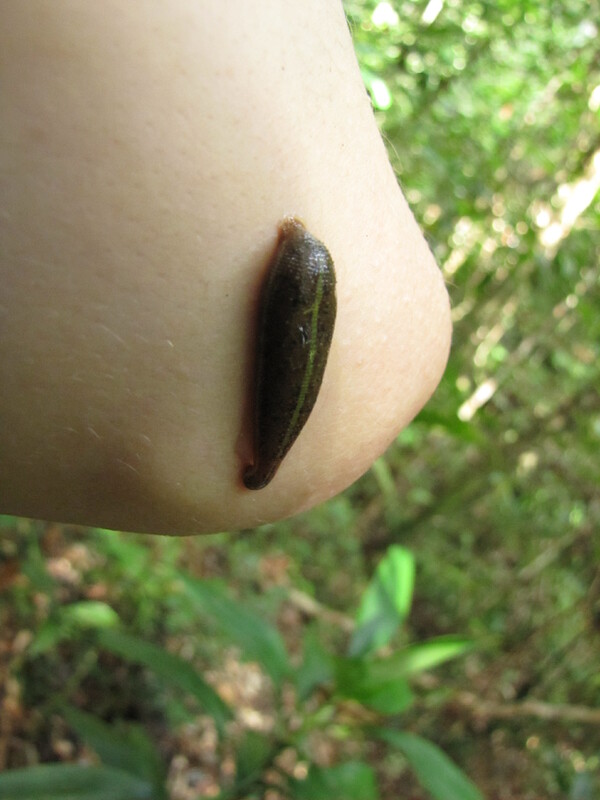 Number 1: As far as anyone is aware, leeches do not transmit disease so I didn’t have anything to worry about. Number 2: If you just yank a leech off there is the chance a tooth maybe left in your skin and become infected. Plus it’s nice to give back to the community HA HA HA! What a lovely read. Writing style is eminently reader friendly. Love this! Highly jealous of the fact you have been to some amazing places! !